“One of these things is not like the other, one of these things doesn’t belong. Can you tell which thing is not like the other by the time we finish our song?”…Ok, I won’t keep singing (thanks to Sesame Street for coming up with the song). This shouldn’t be as hard as it was on Sesame Street since there are only two things to look at in my picture and the difference is pretty obvious. On the package of one of these eggs, which I bought at the store, it claimed it was Farm Fresh. The other egg my husband picked up locally at a farm where they literally went into a simple, wonderfully kept hen house to retrieve eggs to fill our request of 2 dozen. Can you guess which is which? To me is was so obvious, which is why I wanted to share! 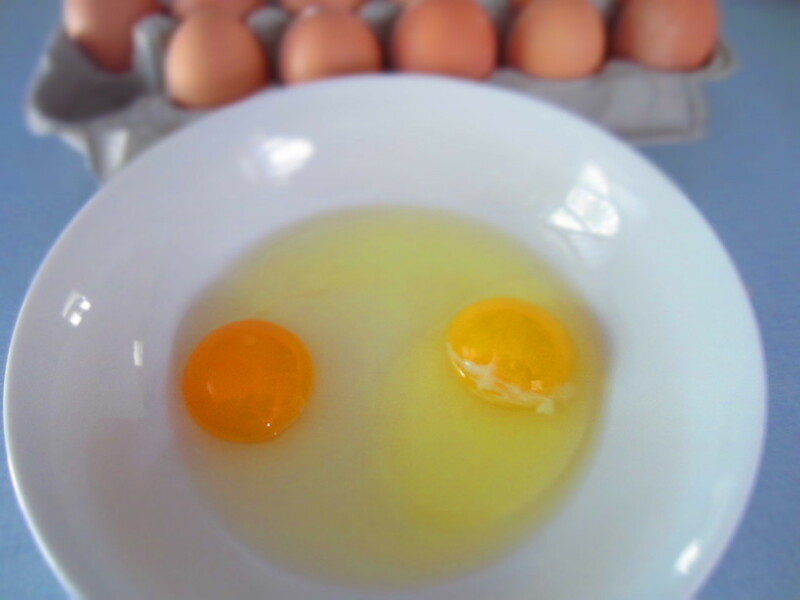 The egg on the left, the one with the rich, dark yellow yoke and the egg white that is nice and smooth (you guessed it) is the egg that was from the local chickens. I’ve got to give credit to the egg on the right, it comes from a place that uses local grains to feed the chickens a doesn’t inject their chickens with growth hormones (or so the box says)….but nothing beats the taste of a fresh egg not to mention beats the experience of seeing the place it comes from. I’m no scientist, but I know when my body responds well to something and feels a major difference (for better or worse) when I eat something. When I have fresh eggs they not only taste better but they fill me up more, keep me full longer, and I feel as if I’m actually getting energy from them that I can use! I’ll always be an advocate of buying local food when you can. Eggs are one of those things that are becoming more and more available through local farmers markets (or every 20 miles down a state highway). So no recipe from me today, just a little visual aid to make you think about trying some local farm eggs the next time you want to buy some. It’s not just the eggs that taste better, but you develop a relationship with the people you buy them from and it really becomes a whole experience instead of simply throwing something into your shopping cart. What an experience these people are giving to us; to be able to let you and your family see where your food actually comes from is priceless! Give it a try…just once! If you go HERE there is a space where you can type in your zip code to find local eggs. If you simply ask around (or ask me if you live in my area) you will be surprised at how many people will give you great references!